Kim Kardashian is already getting ready for tonight’s 2018 Met Gala, the theme of which is “Heavenly Bodies: Fashion and the Catholic Imagination.” In honor of the Catholic-inspired theme for tonight’s Met Gala, Kim threw it all the way back to eighth grade when she was just a “Catholic School Girl.” Kim shared her eighth grade class portrait and it proves that Kim, most definitely, never had an awkward phase. Even though this photo is a school-sanctioned class portrait, it somehow also predicts that one day Kardashian would go on to pioneer the “did it for the ‘gram” movement. This isn’t the first pre-teen throwback image that Kim has gifted us. In 2016, she shared her middle school graduation video in which she sported an ultra-chic chin-grazing bob, proving, yet again, that Kim just breezed all the way through puberty. Do you think Kim’s eighth grade class portrait is a clue toward her Met Ball look? Maybe her interpretation of the “Heavenly Bodies” theme is full catholic school girl uniform? As in, polo and a pleated plaid skirt? Usually, guests of the Met Gala are invited to attend by a designer who dresses them for the occasion. In the past, Kim and Kanye West have been guests of designer Riccardo Tisci (he designed her now-infamous floral turtleneck maternity look at the 2013 Met Gala). 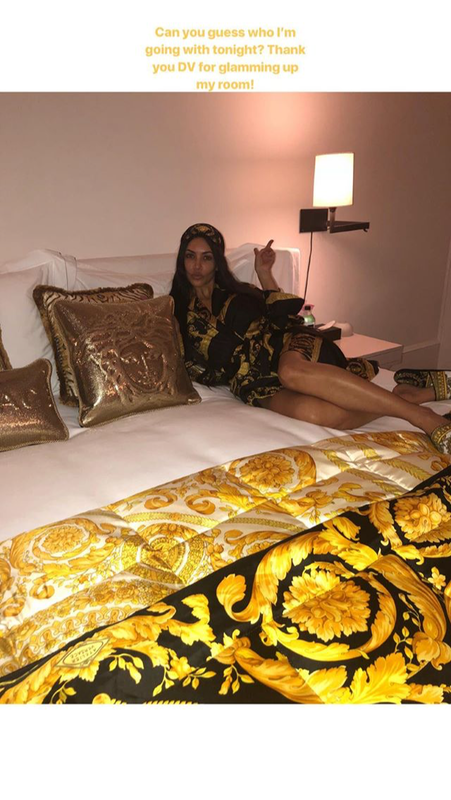 Kim shared an Instagram Story where she teased her designer date and based on the full Versace bed and the “thanks DV” shoutout, we think Kim will be attending as the guest of Donatella Versace and wear a Versace look tonight. Now that we know she’ll be wearing Versace, the idea of her in a plaid skirt feels less likely, but with Kim Kardashian — you never really know. Guess we’ll find out in a few hours.